(CNN) -- For the most devoted Apple aficionados, it's been a long week. 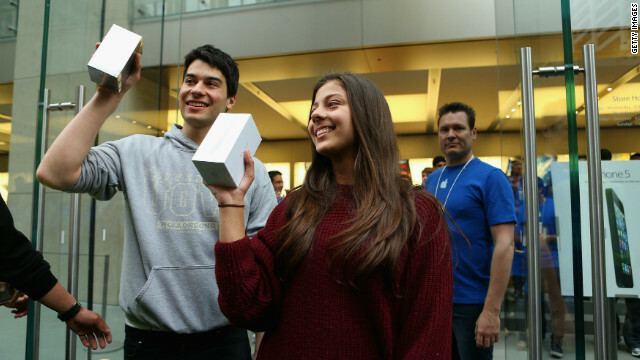 But as Thursday night becomes Friday morning around the world, some of those diehards who spent hours waiting in line were being greeted with open doors at Apple stores and other retailers selling the new iPhone 5. Announced September 12, the iPhone 5 features a bigger screen, lighter and slimmer frame, faster processor and, for the first time, 4G LTE wireless connections. If a handful of tech writers were unimpressed with the specs, that didn't translate into lack of consumer interest. Apple took 2 million pre-orders for the phone in the first 24 hours they were available last week, and some analysts think it could sell more than 10 million by Monday. That first-day total was double the number of iPhone 4S pre-orders the company took last year, and an initial Friday shipping date was quickly pushed back. People who pre-order the phone now, or did so in the past few days, could be waiting more than three weeks for their phones to ship. For those who opted to get personal, the doors at Apple retail stores open at 8 a.m. local time Friday in the United States, Australia, Canada, France, Germany, Hong Kong, Japan, Singapore and the UK. The phone will roll out to 22 more countries on September 28. Despite morning rainfall in Tokyo, hundreds of eager customers lined up outside an Apple store in the city's Ginza shopping district. Store employees handed out umbrellas to waiting customers, some of whom came sporting face paint to celebrate the occasion. "It's almost like a festival, people just camping in the center of Ginza, just drinking and playing and talking to each other," said Taiyo Nakashima, a 34-year-old web designer. "It's not really just buying the phone, it's just enjoying the party, really." 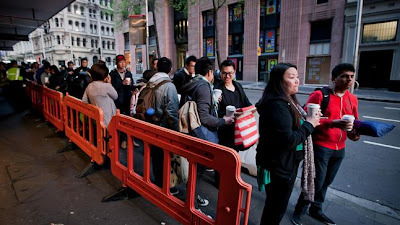 People wait in line outside the Apple store in Sydney to buy the new iPhone 5. In Sydney, Australia, customers camped out in tents and folding chairs. Cheers erupted when the store's doors opened. Todd Foot told CNN affiliate Network Ten that he waited for more than 70 hours to get Australia's first iPhone for sale and review it online. The most popular single smartphone since the existence of such a device, the iPhone has sold more than 244 million units around the world since then-CEO Steve Jobs unveiled it six years ago. According to research firm IDC, the iPhone and its iOS operating system make up 16.9% of the worldwide smartphone market, coming in behind the cluster of phones running the Android operating system, which account for 68.1% of the world's smartphones. The iPhone 5 is 18% thinner and 20% lighter than the current version, the iPhone 4S. It has a 4-inch screen, measured diagonally, compared with a 3.5-inch screen on previous versions of the phone. 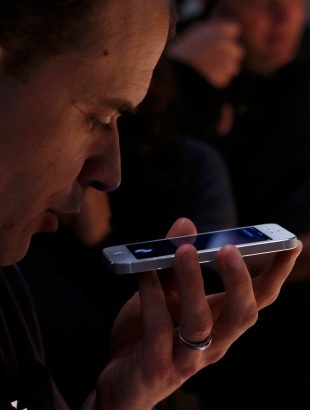 It is the same width as the iPhone 4S but taller, and the iPhone 5 is made entirely of glass and aluminum.